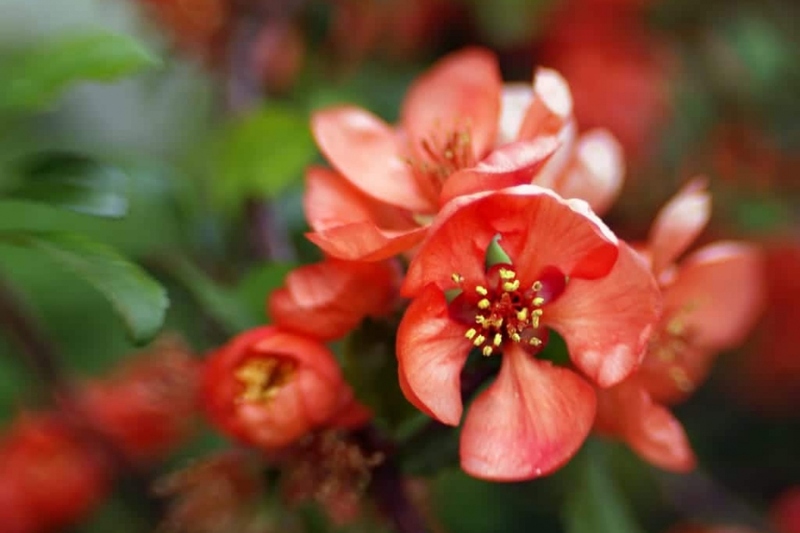 Japanese Quince (Chaenomeles japonica): growing, planting, caring. A wonderful small flowering shrub. Chaenomeles japonica - Maule's quince - is a species of flowering plant in the rose family. It is a thorny deciduous shrub growing to only about 1 m in height, with alternately arranged simple leaves with a serrated margin and red, white, pink or multicoloured flowers in the spring. Small, deciduous, spiny tree measuring 1 to 2 meters long, with alternate, simple leaves, and red flowers blooming at the beginning of spring! The quince tree of Japan likes open soil, and appreciates sheltered and sunny spots, but not hot! It supports tray culture. Before planting, trim damaged roots and branches to balance root volume and foliage volume. Plant in a hole at least twice as big as the root ball. Soaking roots before planting will greatly improve the chances of recovery. Be careful not to bury the base of the stems. Form a hollow around the plant, which will be used for watering during the first months. Tamp the soil - do not hesitate to use all the weight of the body! Finally water until filling the hollow you shaped, at least two watering cans! Prune right after flowering! Remove the faded flowers, and just give your plant a compact shape. Mulch with compost or well decomposed manure in the fall, and with what you have at hand in the spring - dry grass clippings do the trick!